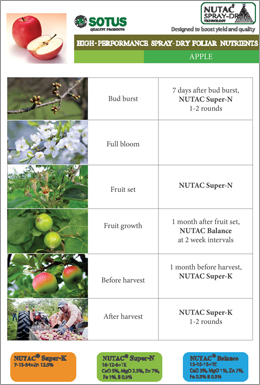 NUTAC® is a Spray-Dried Foliar Nutrition Technology of Sotus International Co., Ltd. Sotus is a successful manufacturer and marketer of NUTAC® high-performance spray-dried foliar nutrients, first marketed in Thailand and now in the Asia Pacific region. 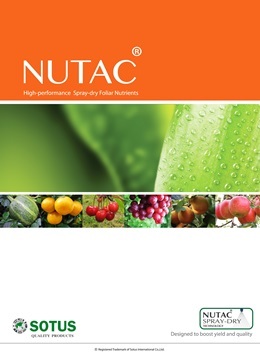 NUTAC® is a specially formulated plant nutrient for foliar spray. It is also recommended as a supplementary source of NPK + trace elements to basic fertilizers where soil fertility level is low or where the root system is poor, under-developed or inactive due to water-logged condition, heavy clay or extremely sandy soils. NUTAC® is a Spray-Dried Foliar Fertilizer designed as a Re-active Micronized Wettable Powder Formulation with Superior Dispersion, Wettability, Spreading Ability, Sticking Property and Compatibility Characteristics. NUTAC® formulations are designed scientifically to boost yield and crop safety. The resultant high-loading phosphate and zinc complexes from the chemical reaction step of the manufacturing process, allows a good synergy of these two key nutrients in our formulations. Phosphates supply the plant with energy while zinc acts on the enzymatic system of the plant. Phosphates, being not highly water soluble, imparts crop safety even when the products are applied at high rates. We offer the world this ultimate product that is different from most ordinary water-soluble fertilizers in the market.